Lion King fans…what does Hakuna Matata mean? Yep, it’s Swahili for “no worries,” and with Monograms, you’ll be singing Hakuna Matata full force. Why? Because Monograms handles all the details of your Africa vacation for you, so you will have “no worries.” On this 8-day private safari (how cool is that? ), we’ve arranged your choice of accommodations, almost all of your meals, game drives, and ground transportation between destinations. We’ve also arranged for you to have a professional Driver/Guide throughout your vacation, a local who is knowledgeable about the wildlife, and will help spot game. Plus, the vehicles we use feature a pop-up roof for easy game viewing and photography. Your vacation begins the moment you arrive in Nairobi, as we can pick you up at the airport, so you don’t have to deal with the hassles of getting to your hotel. The next day, after your included breakfast, we’ll drive you to Ole Pejeta Conservancy, where you’ll see amazing views of Mount Kenya, Kenya’s highest mountain. In Ol Pejeta, we’ve arranged for you to have four game drives. Watch out for Cape buffalo, zebra, wild dog, giraffe, and more. You’ll also visit a chimp sanctuary where orphaned and abused chimpanzees have found a home. And Ol Pejeta is not the only place where you will enjoy game drives. We have also arranged for you to have two game drives in Lake Nakuru National Park, where you have a chance to pink flamingo, white rhino, waterbuck, giraffe, and impala. Finally, we’ll take you to Maasai Mara National Reserve, Kenya’s most famous game area, where we’ll be on the lookout for elephant, rhino, Cape buffalo, gazelle, and many others on your three game drives here. And did we mention we have secured a day room for you at a local hotel in Nairobi at the end of your vacation, so you can be comfortable before transferring to the airport for your late-evening flight? Between the game drives we’ve included, the accommodations we’ve booked, and the private safari vehicle with professional Driver/Guide we’ve arranged, the only thing left for you to do is sit back, enjoy, and capture photos of the amazing wildlife you’ll see on this vacation. With the time saved, the hassles gone, and the comfort of knowing you’ll have a knowledgeable local who can spot game and share stories about day-to-day life in Kenya, you’ve got yourself one amazing vacation! This Kenya safari includes 9 game drives with your own private safari vehicle and Driver/Guide, so you can spend time looking for the animals you want to see the most! 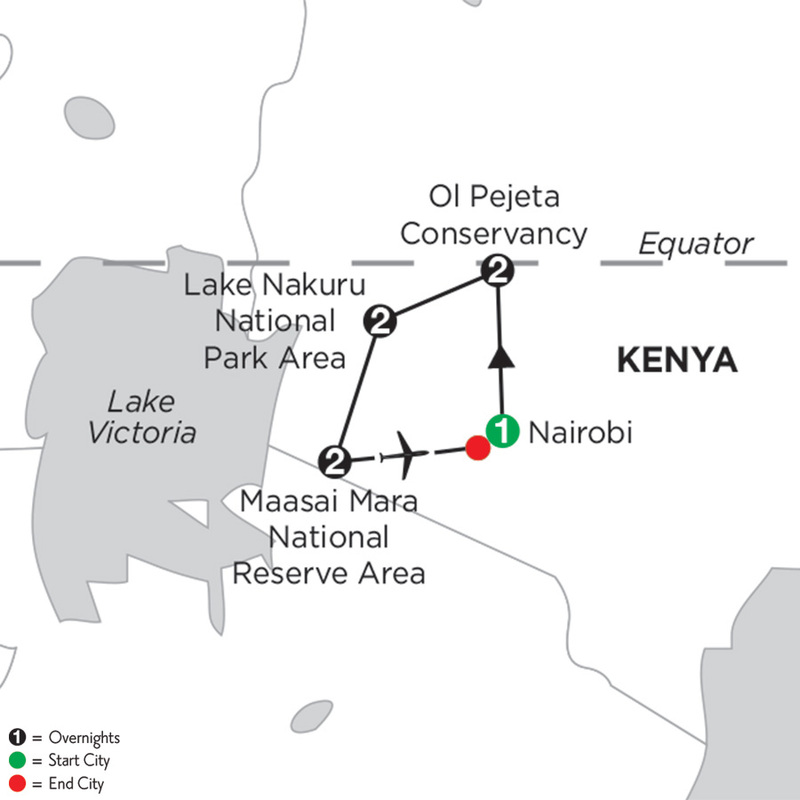 Today, drive to OL PEJETA CONSERVANCY, the largest black rhino sanctuary in all of East Africa. After lunch, embark on your first GAME DRIVE in search of the “Big 5”—lion, leopard, elephant, rhino, and Cape buffalo. Between destinations and for all game drives: private safari mini-bus carries up to six people, and features a pop-up roof for easy game viewing/photography; private transfers to/from airport for all intra-vacation flights; intra-vacation flights and taxes are not included.